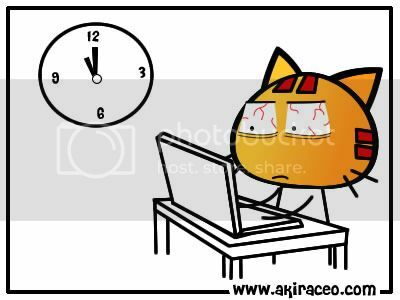 Miao & WafuPafu Comic Blog » Last Day of Holiday..
Posted on September 22, 2009 by Jian Akiraceo. This entry was posted in Rant and tagged bitterstick girl, monday blue. Bookmark the permalink. suan ba… the more u delay, the more tired u’ll be tomorrow during working hours. haha. Hey! I blogged about it! You gonna do that too? Anyway I have lotsa assignments to rush also. Not fun. i’m exactly the same time! Always sleep super late on last day of holiday. Hahaha meaning there’s no resting day at all..
well…..back to “LIFE”….back to “REALITY”….heee…. So sad lah, need to work so early. i have sem break till next week only start class! Happy welcoming back to work! :P.
2 days more to Friday wargh! miao later become sheong mao (panda) dy..
the stick girl not making any blog right? ah.. i do this too! hahaha.. i did nominate you cos I think that the cartoon will took a lot of effort. Really hope tat you can win. Will fully support you. My first trip to SG!! Hopefully nothing happens so i can really go.